R.D. Sherrin was the son of Daniel Sherrin and grandson of John Sherrin, both well known artists. A picture by his father is shown elsewhere on this web site. R.D. Sherrin was born in Whitstable, Kent, served in the First World War and worked in a munitions factory in Rochester during the Second. 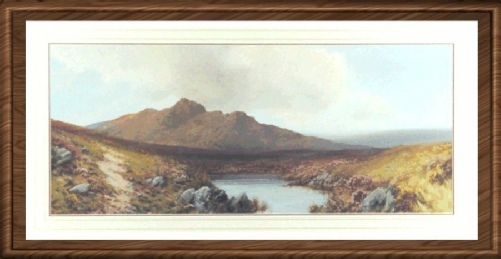 He painted in gouache or watercolour and most of his pictures are of landscape scenes as in these examples. After the Second World War he moved to Devon and produced many paintings of Dartmoor, some of which were reproduced as limited edition prints. You will note the similarity in style to that of Frederick John Widgery (see elsewhere on this web site for more information on that artist) and apparently the two artists used to travel together to paint and sketch. R.D.Sherrin signed some of his pictures with pseudonyms such as J.Whiteley and D.A.Niel.